Grizzly Salmon Oil is sourced 100% from wild Alaskan salmon. The oils and fatty acids work to support a healthy coat, heart, and immune system – who wouldn’t want to give their dog all the Omega 3s and 6s they need especially when we do it for ourselves. A deficiency in these fatty acids often shows up as a skin problem, even while the coat itself seems healthy. I’ve had this problem with my Shih Tzu, and there is nothing like wild salmon oil to bring out a new luster in the coat and recondition the skin itself – no more flaky patches. It doesn’t take long to see a difference – sometimes you can start seeing a difference in as little as 6 weeks, but depending on your dog’s condition it can take 12 weeks to see results. Introduce oils with care – you may see loose stools, so back off a little on the dose if this occurs and let your dog’s system get slowly accustomed to this new regimen. When you give your dog the benefit of salmon oil you’re not just getting results on skin and coat, but also giving your dog a vital source of support for the immune system, while reducing inflammation maintaining joint health and protecting the heart. If you have a dog with arthritis, you know that giving them omega 3s is part of the standard treatment. Studies have shown that omega3s even slow damage to cartilage. There is talk about fish oil having less omega 3s than flaxseed oil, but the facts are that there are more bio-available omega 3s in the fish oil for dogs. Their bodies can easily convert what’s in fish oil, but it has to work harder to get what it needs from plant based omega 3 fatty acids. ‘Nuf said. No fish oil is an easy keeper and I would never leave salmon oil out on the counter-top. Always refrigerate…regardless of what the bottle says;) Nobody wants to give their dog rancid oil. Generally dosage depends on several factors, not only body weight of your dog, but also changes from product to product and the reason you are adding salmon oil to your dog’s diet. If you are using it as a preventive supplement, 1000mg a day for a 40-60lb dog seems to be a guideline, but if you are concerned, you should be able to call your vet and get an answer without incurring an office visit. You do not want to give the dog too much or try to “make up” for a missed day by doubling the dose – blood clotting problems can result. There are other conditions omega 3s are being used to treat, including yeast infections, allergies, hypertension, autoimmune conditions, some types of cancers…it really is a wonderful product to give your dog. 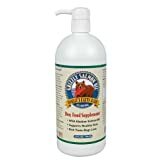 Find more Grizzly Salmon Oil All Natural Dog Food Supplement products on Amazon!